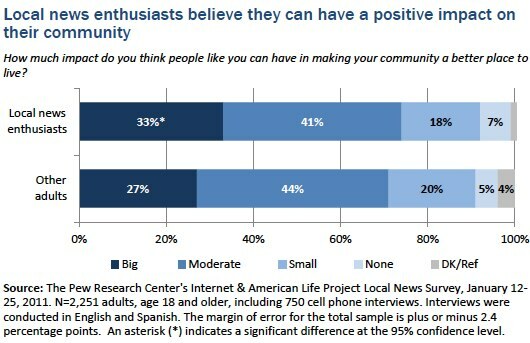 Local news enthusiasts, like other adults, hold positive views about their communities, but they are slightly more likely than others to believe they can have a big impact on improving their communities. Eighty-two percent describe their community as an excellent (38%) or good (44%) place to live, which is comparable to the percent of other adults who say their community is an excellent (39%) or good (42%) place to live. Among local news enthusiasts, older residents are slightly more likely than younger local news followers to describe their community as excellent or good (84% v. 79%). However, slightly more local news enthusiasts than others think they can have a big impact on making their community a better place to live (33% vs. 27%). Local news enthusiasts’ feelings of empowerment may be due to their longevity in the community. 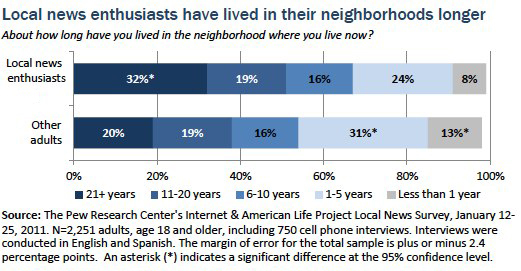 Three in 10 (32%) have lived in their current neighborhood more than 20 years or all of their lives, compared with just 20% of non-local news enthusiasts. Not surprisingly, local news enthusiasts age 40 and older are most likely to be long residents of their communities; just 15% of younger local news followers have lived in their communities more than 20 years, and more than half (53%) have lived in their community five years or less. 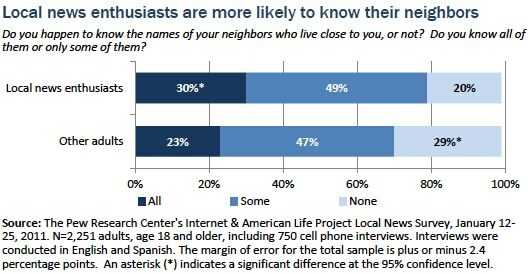 Local news enthusiasts as a whole are more likely than other adults to know those living around them. Nearly eight in 10 (79%) local news followers say they know their neighbors, including 30% who say they know all of their neighbors. Those who do not follow local news closely are slightly less likely to know their neighbors; 70% know their neighbors, including 23% who know them all. Yet again, this familiarity with neighbors is due mainly to the rootedness of older local news enthusiasts. Local news followers age 40 and older are significantly more likely than their younger counterparts to say they know all of their neighbors (34% v. 23%) and much less likely to say they know none of them (15% v. 28%).